A seed potato is such an ugly, disappointing artefact. Shrivelled, discoloured and unappetising. If you hide them away in a gloomy, cool place for a few weeks they will - if you're lucky - sprout small, green buds of hopefulness. 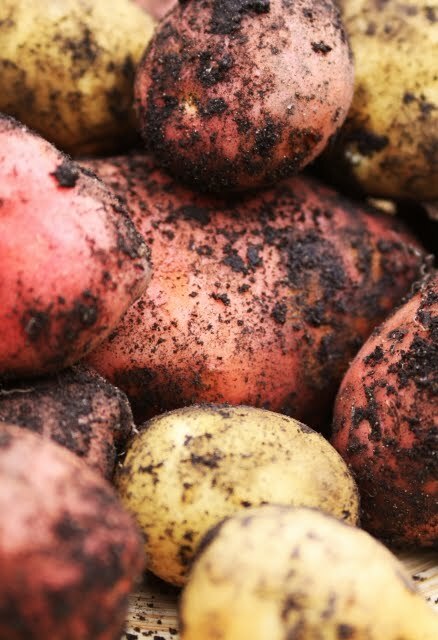 With each bud is the promise of a runner that will, when the spring is out, deliver a crop of tasty, tangy potatoes. Plonk one or two of those nobbly seed potatoes in to the bottom of a plastic bucket and fill it up with just enough compost to cover the potatoes. Within a few weeks (or, if they're really eager, a few days), the first signs of life will poke their nervous heads out from beneath the soil. As soon as they appear, cover them over again with a little more compost to keep them in the dark and show them whose boss. Repeat. Several weeks later, when you can top the bucket up no longer, let that luscious green foliage spread up and out into the great wide world. Once the leaves have flourished into great green bushes, the plants will flower (don't hold your breath, the flowers are really not that impressive). Don't be tempted to dig your potatoes up just yet. The plants may be at their most impressive but you have to give these things time – there are exciting things going on under the surface that you shouldn't interrupt... not yet. Those last few days and weeks are the ones that count. It may be sad to watch your bright, healthy green plants turn yellow, then brown. The leaves will wilt, the stems will shrivel and only then, when you are embarrassed to keep such a miserable-looking plant on display in your garden, are you ready to reveal treasure. Tip the bucket on its head and give it a good shake. Delve into the soil and rummage around, feeling the warm and grainy earth between your finger-tips. Feel the adrenalin rush as you discover each golden nugget of potatoey-goodness. And then, with your crop (however small in number it may seem), proceed immediately to the kitchen! Boil them, season them and then... devour them. It may be months in the making, but a bowl of home-grown early new potatoes results in a few moments of tingly, delicious nirvana. As a child, I remember eagerly following my Dad to the end of the garden in the evenings to help him cut the herbs from his modest herb-garden that would then be used to cook dinner. It is through this involvement in the herb garden that we were introduced to the more complex flavours of herbs and spices and learned not to be afraid of 'grown-up' foods. As I grew older, I learned to help him grow vegetables and fruits in our garden (and, through my Mum, I learned to help cook them, and eat them!) I am so much looking forward to sharing similar experiences with Lara over the years to come. You don't need a big garden to grow your own food; in my experience, many herbs and vegetables actually turn out just as tasty and prolific if grown in patio pots (or plastic buckets). If you would like some tips, give me a shout. This post was written for this week's writing workshop at Sleep Is For The Weak, I used prompt 2 and was inspired by a recent post at My Daddy Cooks and by my recent winnings from Bringing Up Charlie who are both very worthy nominees in the MADs (a quick reminder... please vote for me! ).